After a half-decade of Zelda, Grezzo gets to make their own thing and that’s awesome. So the game is pretty great but how about that ESRB rating summary? Rightfully earning the last laugh at E3 2016, Nintendo’s Zelda show wound up winning the day. Let’s start this off by eating some crow. I didn’t track down any exact quotes of mine, but back in April when Nintendo confirmed that the new Zelda would be the only game playable at E3 2016, I likely guffawed. I might have said something like “well, they sure as hell gave up this year.” It seemed like yet another arrow to the heart of E3 following EA’s split, Disney’s demise, and Activision’s lack of booth. Honestly? We can probably just say this is all Francis the Chameleon’s fault. At E3 2016, Nintendo showed off Paper Mario: Color Splash, due out on October 7 on Wii U. 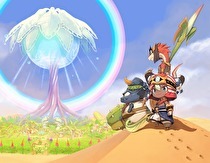 The Treehouse Live demo confirmed what most figured: this wasn’t a secret sequel to Thousand-Year Door’s RPG stylings. Instead, it’s a card-based follow-up to Paper Mario: Sticker Star. When Color Splash hits later this year, the non-RPG Paper Mario games will outnumber the RPG ones.